Sometimes events go well because they've been planned and executed meticulously. And sometimes events go well because even though they've been planned and executed very well, circumstances beyond anyone's control intervene and everybody responds spontaneously and with good grace. 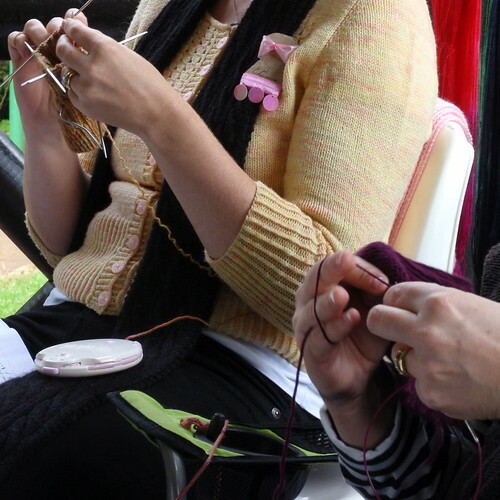 Knitting Camp last weekend at Mt Keira definitely fell into the second category. Over the last few months we've had lots and lots of rain. Last weekend was no exception. 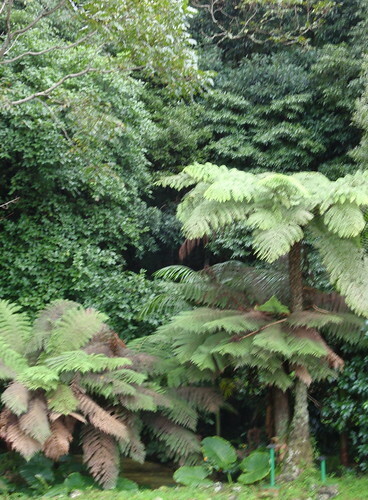 On Friday, a number of us drove to Wollongong and Mt Keira through constant gusts of rain - with the excitement along the way of needing to squeeze by a large tree that had fallen across the road in the National Park we passed through. 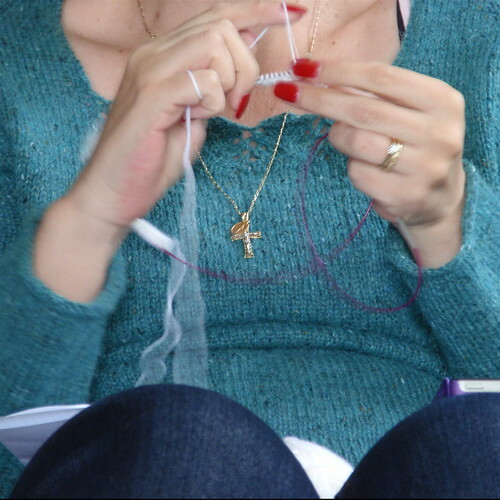 One of the usual highlights of knitting camp is sitting outside in the autumn sunshine, knitting while surrounded by the amazing, densely green vegetation of the camp. 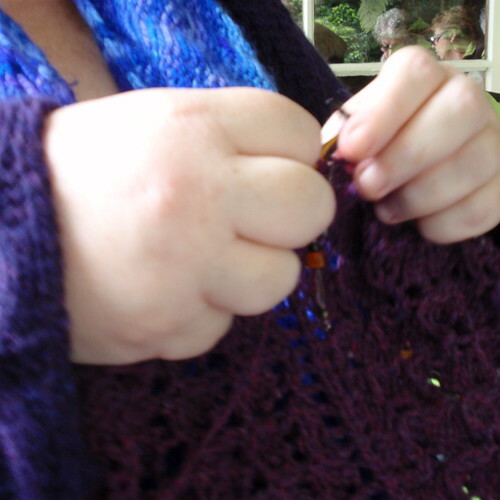 On Friday and Saturday we resigned ourselves to knitting inside, just glimpsing the surrounds as we dashed with umbrellas between meals and knitting and bed. On Saturday afternoon - crisis! The camp lost its electricity and because of some rather eccentric arrangements for the supply, it was unable to be restored. But knitters are resourceful people. While the camp organisers scrambled to acquire a portable generator, and gas cylinders for cooking our meals, the knit campers knitted - moving to the verandah to chase the fading daylight and eventually knitting by torchlight and headlamps and camping lamps supplied by nearby friends and family. Webgoddess had brought her ukelele and we even had knitting singalong. Some great moments. There was a best ever knitting trivia quiz. I never think of myself as competitive until I become involved in such activities and realise that I want to win. My group didn't win - even though we cheated we were overtaken at the last minute by a group who were unfairly advantaged by having two knitting store workers as members. 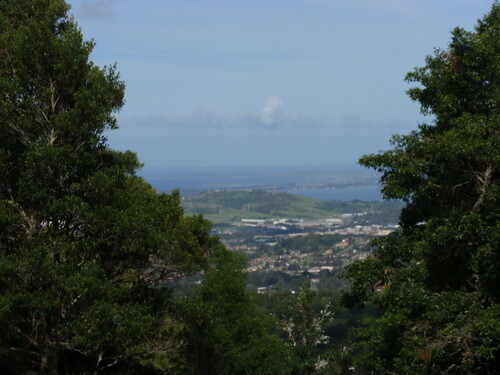 Sunday, finally, was sunny, with the view from the mountain revealed. 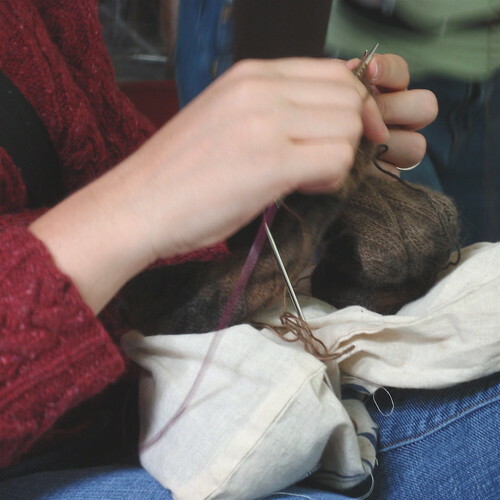 But knit camp is ultimately about knitting and the companionship of knitters who, on this occasion, dealt with the less than perfect circumstances with a combination of grace and hilarity. I suspect there was much unravelling of knitting when the results of knitting in the dark were revealed. Huge thanks to Christine, Kerry and Rae from CR&K Daisy Designs who organised the camp and remained calm and cheerful under the most trying circumstances - and put together a great trivia quiz. Visit here for another account of camp. Acknowledgment to Probably Jane whose idea I stole for the pictures of the hands. And yes, I did buy yarn. Oh you tease Lyn! 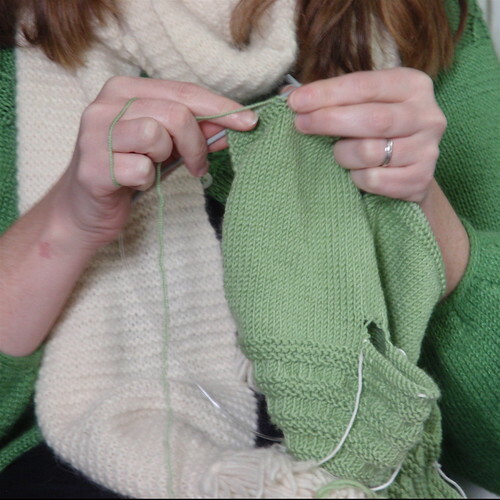 Yarn details please, pretty please with sugar on top?! Love the hands photos. Wish I was at camp! 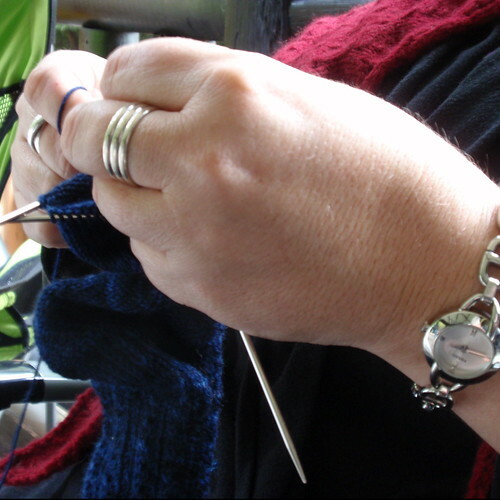 a montage of knitters and their hands never goes astray. It's a great concept. Oh your story makes me yearn for our little cabin in the woods and my knitting basket on the porch...especially the loss of electricity - a common event for us up north! Oh, that sounds like so much fun. And you say you cheated! My My! such a great time! 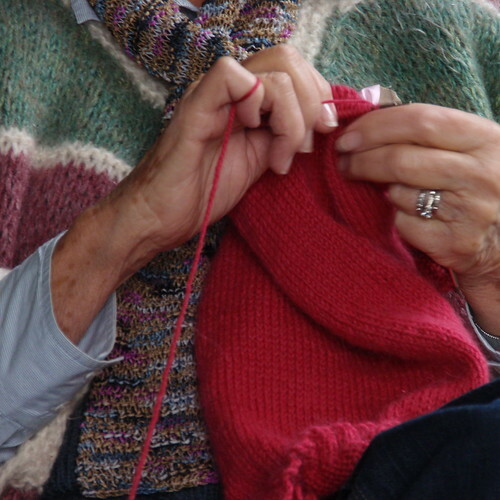 love the hands, you can see everyones different knitting styles, very cool. it is a shame our cheating didnt pay off, we did well all things considered! I LOVED your take on camp Lyn - very funny - and I LOVED the hands. I was wondering what you were up to with your camera and now all is revealed. I had a ball ! I'm glad you all had a good time - despite the circumstances. 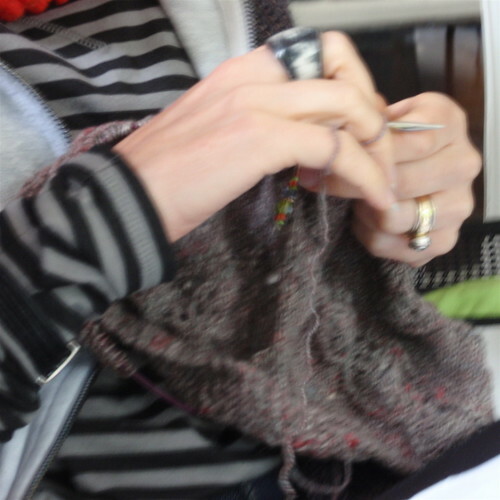 See my "photo" - hands knitting! and a fine crop of hands they are too - can it really be a year since I took mine? Makes me wish I'd been there with you all.